The SmartGate automated face recognition-based passenger clearance system in use at the Auckland, Wellington and Christchurch Airports in New Zealand has processed its 500,000th passenger. Government officials involved in the implementation of the system see the milestone as a mark of success it has enjoyed as well as how quickly the New Zealand citizenry has taken to using the new technology. 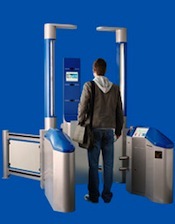 The SmartGate systems are only in use for arriving passengers, but travelers at Auckland Airport will be able to use the SmartGates for departures starting Dec. 1 with the rest of the airports having the same capabilities rolled out throughout 2011. The hope for the introduction of SmartGates used on departures would be better integration with Australia’s SmartGate system wherein travelers leaving New Zealand for Australia would be able to complete the Australian arrival process while departing New Zealand.